The covers come off Structure Twelve after another morning of rain. The newly discovered decorated stone from Structure Eight. Like yesterday, as the day was drawing to a close another fabulous find was made – this time by Dr Antonia Thomas, our art expert. While carefully dismantling the later buttressing to Structure Eleven, she glanced across to the outer revetment wall of Structure Eight. Recent rain had removed a deposit that butted the lowest course of the revetment, revealing a new panel of art – double curved lines arcing over a rosette of small cup marks. Although other “rosettes” have been discovered on site this combination is unique. Closer examination also showed a larger shallow cup mark to its right. Another to add to our massive catalogue of art – well spotted Antonia! We are now in that strange period at the Ness where half of the excavation time has expired and only half lies ahead. Dr Ingrid Mainland gives her first impressions of the animal bone from under the buttress in Structure Ten. It is strange because, no matter how successful the first four weeks have been, you still lament the time gone and opportunities inevitably missed. But, on the other hand, there is the promise of four more weeks and all the new opportunities which will arise. Yet again, though, there is the last closing down week with all the difficulties and gloom which that brings. And then there is . . . oh we could go on forever. We bet you never thought archaeologists could be so sensitive, so introspective, so in tune with their inner feelings. And now to the hard stuff. This morning was lost to excavation because of the miserable, damp and blowy weather. But, by midday, the diggers were emerging from wherever they had sheltered and work began in earnest. You will recall the human long bone excavated from the buttress in Structure Ten, together with some fascinating pottery. The humerus was identified as human by two of our own experts, but we were delighted to be visited today by Professor Andrew Chamberlain, of Manchester University. He is a distinguished osteologist and was asked by Nick to have another look at the bone. Lorraine with another fine discovery from Trench X – a ‘pillow’ stone. It was indeed, he said, from an adult human who was also, probably, quite tall. The person’s build was gracile, or relatively slender, but large muscle attachments were visible on the bone indicating an active life. Lastly, there were some signs of arthritis in the area where the bone would have met the shoulder indicating, not just an active life, but a hard one. Our own bone expert, Dr Ingrid Mainland visited site to have a look at the articulated (connected) animal bones, which accompanied the human bone. Ingrid has several measurements still to take, followed by some deep thought, but she feels that the bones probably represent two animals and that one of them was a very large beast indeed. She will be back soon and we are keen to learn more. At the end of activities yesterday you will also recall the discovery, in Trench X, of a handsome macehead. A close-up of the broken pillow stone. Today, less than a metre away, Billy and Lorraine uncovered another polished stone tool – this time a “pillow” stone. This is a type of artefact unique to the Ness and this one is a fine example of highly polished Lewiston Gneiss, with very fine banding and areas of pinky quartz with gold biotite. Nobody is sure of the function of these stones, but one suggestion is that they were used by leather workers to shape and polish leather articles. The fact that it is damaged suggests that it was re-used for a more heavy-duty activity. There will be no excavations on site tomorrow as the diggers will have a day off in preparation for Sunday’s Open Day – the first of two we will be holding this season. It starts at 11am and finishes at 4pm. There will, however, be site tours tomorrow, Friday, at 11 am and 3 pm. 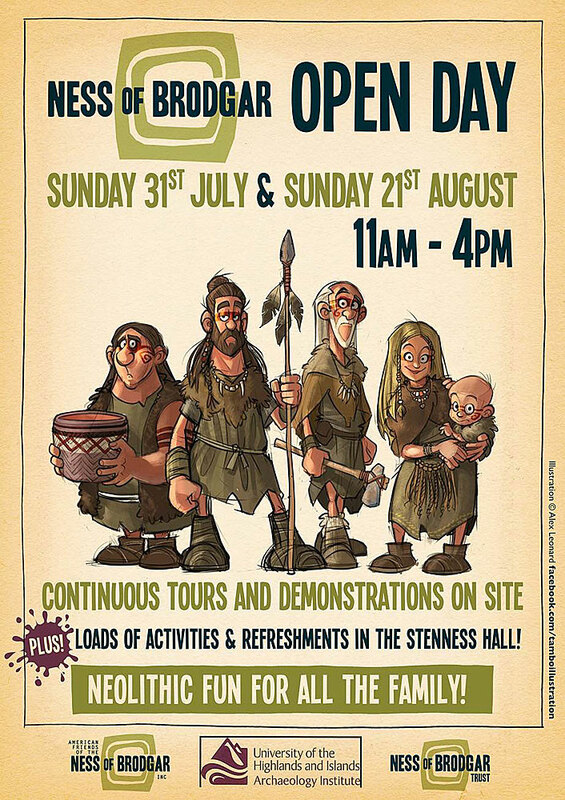 Sunday’s activities will include lots of tours and demonstrations on site together with activities and refreshments at the nearby Stenness Hall. We hope for good weather. Is that too much to ask? Today’s ‘From the Trenches’ blogger, Derek. Hi there, my name is Derek, I am one of many students at the site this season hailing from Willamette University in Salem Oregon. Unlike a lot of the students on site, I am not studying archaeology or anthropology, instead I am an environmental studies major, bringing a varied skill set and background to the site. Since early age, the study of history and prehistory has fascinated me. This fascination does not stem from an early obsession with the Indiana Jones movies, and mostly came from the influence of my dad, who reads and studies archaeology closely, despite not being an archaeologist himself. Both my mom and him inspired in my sister and I a curiosity and passion to pursue our interests, which surprisingly has lead us both to volunteer and spend summers on separate archaeological sites in order to satisfy this curiosity. Although I do not intend to become an archaeologist, the work I have done, people I have met, experiences I have gained, have been both life changing and inspiring. I will be leaving the site in a week and cannot help but think about not only the thousands of visitors who visit the site in its modern era, but the thousands before who have left their mark here in the structures, midden, and landscape. Today saw our group arriving to site early only to find out we would be on weather delay until the afternoon. The Ring of Brodgar, Stenness. Instead of letting the weather and inability to put trowel to ground get us down we headed on a tour of the surrounding area World Heritage Sites. Led by UHI’s Dan Lee, we first visited the Ring of Brodgar, followed by the Standing Stones of Stenness, and ending the World Heritage tour at Barnhouse, a Neolithic settlement just a stone’s throw away from Standing Stones of Stenness. It has been almost three weeks on site for the Willamette students, yet we had not visited the sites that add to the wonder and setting of the Ness. Every day I am reminded of something the site director, Nick Card, related to us on our first visit to the site – too often we (archaeologists) get tunnel vision on site and attempt to go from the micro to the macro. It is easy to get lost in the midden at the Ness, but if you just look up every once in a while on site one is reminded of the incredible landscape that surrounds us here. I invite all avid readers of this diary, who haven’t already, to visit Orkney and when you step on site here look to the lochs that line the site, the high hills of the island of Hoy, that lie to the west, and the immense concentration of ancient activity centred around this area we volunteers get to call home. Thank you.